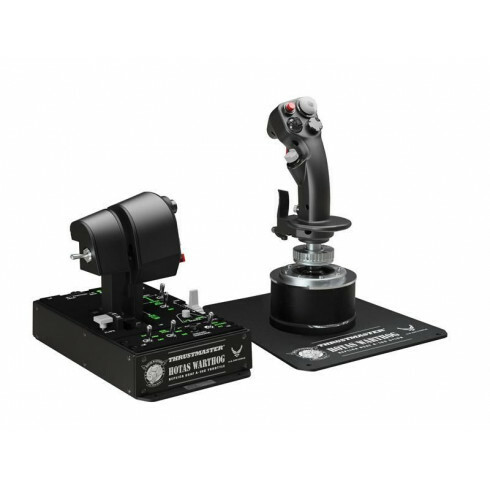 Thrustmaster HOTAS Warthog for PC - Voor al je racegear! I`ve been flying in flight sims for 17 years, and used 4 plastic joysticks over that period. Recently I started feeling that some change had to be done, since I made less and less flying. I thought about going plastic again, but decided against it, and it was the best decision! Saved some money over a couple of months, searching for a used Warthog on Ebay, but even the used ones came close to the price of a new one when bidding. So, searching through the Thrustmaster site I came upon this site, and found that the price and delivery was the most acceptable for a new Warthog. It came on time, no problems at all, very fast delivery. Plugged it in, and immediately thought to myself that I should have bought it earlier... Just as it came out, to be precise, 6 years ago... It is that good. The feeling, all metal, buttons and switches feel like the real thing. And most importantly, the stick has a razor sharp precision, as does the throttle. Just what I hoped for, and needed, to continue enjoying flight sims for years to come. There is a huge difference between using plastic joysticks and Warthog during carrier landings and formation flying, maybe the two most demanding flying activities. Warthog gives me precision that I did`t think was possible. Flying fast low level, just feet off the ground was something that was hard to do with other joysticks, but not with Warthog. Buying this led me to considering buying the HOTAS Cougar, just to try the Warthog`s predecessor. And I am also looking forward to see what will be the next hi-end HOTAS from Thrustmaster!